A new pond has been digged out, liner is in place and the pond edge has been finished. So, ready to fill the pond! However, before you open the valve, there is an important job left to do. 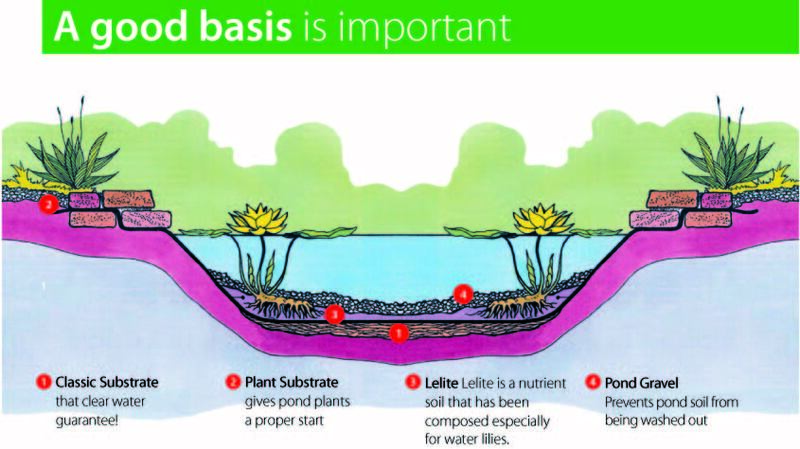 A layer of pond substrate on the bottom of the pond will be the basis for a stable pond environment. The micro-organisms which will take care of clear pond water need some subsoil to adhere to. The porous rock on the pond bottom offers space to these useful bacteria. Cover the whole pond bottom with a few centimetres of substrate. Simultaneously add a dose of water purifying bacteria to achieve result rapidly. Now your pond is ready to be filled with water. As bacteria like oxygen rich water, you should use many oxygen producing plants. During filling you can start applying oxygen producing plants the pond. Sometimes bottom substrate is also used to cover the soil in plant baskets. However, it is better to use special finishing substrates to cover the soil in plant baskets, marsh and pond bottoms. If you want to apply a helophyte filter, usually lava grit is used. If you have bottom drains in your pond, you can not use pond substrate. The drains would soon be filled with substrate.